Johnny Manziel, Teddy Bridgewater, Michael Sam, Blake Bortles and other top prospects sign deals to appear on new Upper Deck trading cards! Carlsbad, CA (February 26, 2014) – The first licensed football rookie cards of the year will debut in 2014 Upper Deck Football and fans can expect to see some of the best prospects in the game. Over the past several weeks, Upper Deck has been busy signing deals with the highest-profile players who are a part of the heavily touted 2014 pro football draft class. Signing sessions with many of the players have already begun as Upper Deck acquires hard-signed signatures for the company’s popular “Lettermen” autograph cards. 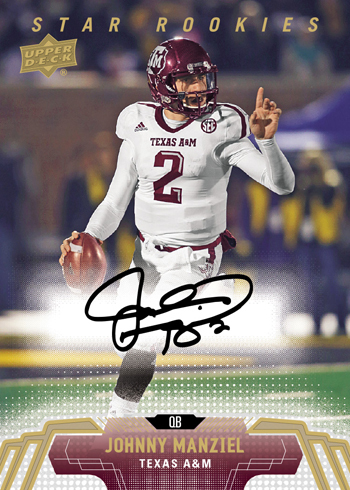 Upper Deck will be the first trading card manufacturer to deliver fans licensed rookie cards of top talents like Johnny Manziel, Teddy Bridgewater, Michael Sam, Blake Bortles, Derek Carr, Ka’Deem Carey, Sammy Watkins and other sensational draft picks to be. Fans and collectors can look for rookie cards (including autograph versions) of these young stars when 2014 Upper Deck Football hits shelves on April 16. Football fans can find 200 different rookie cards in the 2014 Upper Deck Football set from first-round superstars to sleepers that inevitably take collectors by storm once they hit the gridiron and showcase their talents. Beyond the regular Star Rookie cards, fans can find short-printed photo variation rookies, glossy rookies numbered to just 10 copies, and autographed rookies. Additionally, Upper Deck pays homage to the past with the “1994 UD Tribute” insert set featuring veterans and rookies along with autograph parallel versions. The “College Mascot Patch” insert cards have been incredibly popular over the last two years and the 2014 set has evolved into “College Tribute Patch” cards. This new insert series uses patches to highlight college football traditions from around the country. Whether it be the “smoke show” at Miami or Howard’s Rock at Clemson, fans are sure to be clamoring to collect the entire 60-card set. Every hobby case will deliver four of these patch cards on average with varying levels of rarity. Also returning are “Predictor” cards which became very popular during the 1990’s. These interactive cards offer collectors exclusive prizes if the player depicted on the card is the first player picked at their position in the 2014 pro football draft. These rare (1:1,440 packs) “Predictor” cards for the QB, RB and WR positions are sure to bring an added level of excitement and value to the pack opening experience! The next great crop of Star Rookies are coming in 2014 Upper Deck Football this April.